The Law and Popular Culture DVD Collection consists of feature films, documentaries, and television shows in all genres. depicts a story about the law, legal systems, or legal education. The Law and Popular Culture DVD Collection can be found on Level 2 of the Law Library, next to the elevator. The DVD cases are arranged alphabetically by title. You also can search InfoHawk+ by keyword, title, author/creator, and subject. Users may borrow up to three DVDs at one time, for a period of seven days. 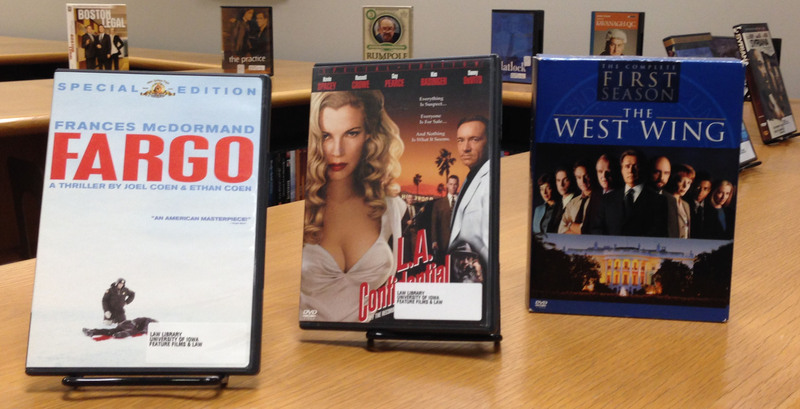 Locate the movie case in the collection and bring to the Circulation Desk. A circulation staff member will retrieve the DVD and check out the item. When leaving the library, users must have circulation staff hand the DVDs around the security gate. All DVDs are to be returned to the Circulation Desk.